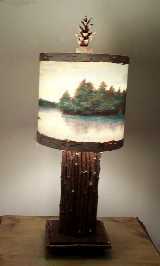 Adirondack pine cone lamp is made with a hand painted and kiln fired stained glass shade. 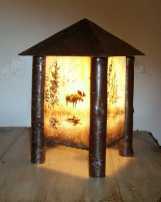 The base is made of painted hardwood with natural birch bark and twig accents. A real pine cone finial completes the look. 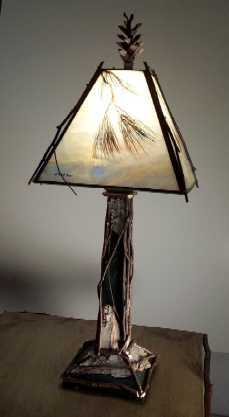 A natural wood sapling of golden birch is the perfect compliment to the exquisite hand painted and kiln fired glass. The top is hand made tin with a rustic patina. 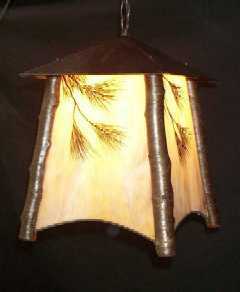 Currently the studio is producing three sizes of these pendant lamps. 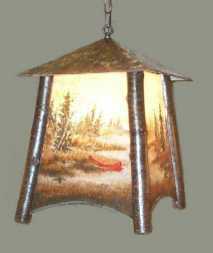 Available with a pine bough design or a woodland or lake scene. Custom too! 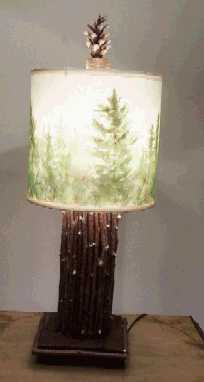 "Forest Lamps" . Contact us for any special lighting needs. To request more information and specific pricing on any of the above items please send us an email.